I only have a few minutes to post, but I thought you might like to see this awesome mug cozy I whipped up yesterday. It is called the Cabled Coffee and Hand Warmer, pattern by Ali S., though the pattern is now discontinued. It took me about 2 hours to knit. I love it because it dresses up my favourite mug which is just plain cream-coloured pottery. One thing I’ve been up to: Knitting, of course! 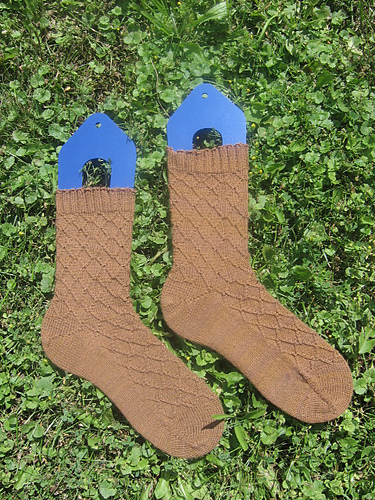 Over the last few months, I have knit several pairs of socks. As you know, I am involved in a knitalong on Ravelry where members are knitting through the patterns from Cookie A’s book, one per month. This month’s pattern was Angee. It was a fabulous pattern, easy and fun. I have had times where I am scrambling to finish my socks by the end of the month, but this month, I finished in a week! I used a wonderful yarn, Zen Yarn Garden Smooshy, in the colourway ‘Robyn’s Gold’. I think the pattern works well with both variegated and solid colourways. I also knit this pattern two-at-a-time, toe-up without inverting the pattern, so if you look closely at the finished socks of other knitters, you will see that mine differs (compared to others — upside-down). These are knitted from the free pattern, Temperance by Liz Abinante. I really like the way they turned out, though they took me a very long time to knit. I did the 80 stitch version with 2mm needles. As usual, they were knitted toe-up and two at a time. I bought the yarn, Kettle-Dyed Essential in the Oak colourway from KnitPicks (on Sale!). If I were to knit these again, I would probably go up to 2.25mm needles and I would also not do the twisted stitches as the pattern suggests. I found the pattern’s method very time consuming and fiddly and wish I’d thought to switch methods before I was on the last repeat! In the end, I switched to the method used for cabling without a cable needle. Ahhhh. Much better. If you would like to learn how to cable without a cable needle, I suggest checking out the quick how-to video at Knitting Help. If you go to advanced techniques and scroll down, you will see the video marked, “Crossing Cables without a cable needle”. Don’t worry — it’s a cinch. …that many of the knitting-related posts I do here don’t get a lot of comments. Perhaps you are just speechless with my knitting genius or maybe you wish I’d just skip the crafty/knitting posts and stick to homeschooling and food and homemaking topics. Anyway, I thought I’d use this as an excuse to do a poll. I would love it if you would vote. In a knitalong group I participate in on Ravelry, I was the lucky one to win the prize for April. It was not because of my talented knitting, but rather my name was randomly drawn. Nevertheless, I was very excited. My prize arrived on Tuesday all the way from Scotland. In the photo you will see: A sweet card from the group administrator, a lovely bag of tea called ‘a moment of calm’, (which is great for a mom of six kids! ), a cool key chain and some delish-looking hot chocolate that is calling my name right now. In terms of yarn, you will see: the beautiful lavendar/pink/lilac yarn which is from Old Maiden yarns, a stunning skein in bright red with a touch of yellow and purple from the Knitting Goddess (colourway is Goddess Chakra Red) and a skein of Tofutsies from South West Trading Company in green/blue/purple/white, which I can’t wait to try out. You will also see my very own lavendar bag kit from the Knitting Goddess, which I am very excited about! (I have never tried BFL yarn.) I am also looking forward to receiving a cool book from Larissa Brown called Knitalong as well as this skein of gorgeous yarn from colourplay fibers! What a great prize. I am so excited.